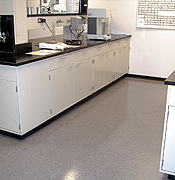 Decorative Quartz Broadcast Systems | Floor Coatings, Etc. Decorative Quartz Broadcast systems are the decorative cousin to the Full Aggregate Broadcast systems described above. They are applied in the same manor; but instead of using a natural aggregate with pigmented epoxy and urethane topcoats, they use a multicolor blend of individually pigmented Quartz granules and clear topcoats. They often include an integral, trowel applied cove base and provide the same heavy duty surface as the full aggregate broadcast shop floors but with a more aesthetic finish that is available in an infinite number of color combinations. These systems are very popular in the auto dealer service write up lanes, customer waiting areas, bathrooms, lunchrooms, labs, assembly areas etc. any place where a heavy duty floor that’s aesthetically appealing would be beneficial. Contact us today at 302-322-4177 to learn more about our Decorative Quartz Broadcast systems.